In order to transport the various 787 Dream liner wings and other sections being fabricated by subcontractors all over the world, Boeing modified several of its 747s to a Dreamlifter cargo configuration by enlarging the 747 fuselage. 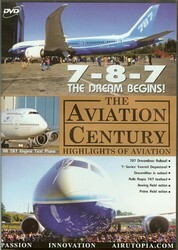 This Dreamlifter aircraft is also featured prominently on the DVD. Another 747 was modified to become a flying test bed for the Rolls-Royce engines that will power the 787. One of the 747 engines was replaced with a 787 Rolls-Royce engine so that various tests can be performed on the powered engine while in flight. Finally, as the day of the 787 rollout approached, Boeing arranged for a special "7-Series" commemorative flight to honor all of the 7x7 series jets that the company has produced, from the 707 to the 777. On the DVD, see these aircraft gather at Paine Field, Everett and takeoff in sequence about every 10 minutes to Boeing Field, Seattle. They were led by a 30 year-old Omega 707 and ended by a new undelivered 777-300ER for Air France.